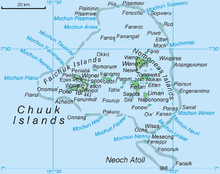 ^ Weatherbase: Historical Weather for Chuuk Islands, Federated States of Micronesia. Weatherbase. 2011. Retrieved on November 24, 2011. ^ Goodenough, Ward Hunt. 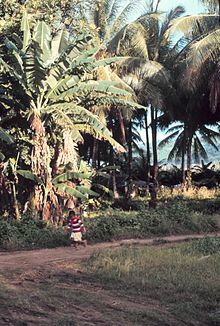 Under Heaven's Brow: Pre-Christian Religious Tradition in Chuuk. American Philosophical Society. 1 January 2002: 17–18. ISBN 978-0-87169-246-7. ^ Coello, Francisco. Conflicto hispano-alemán. Boletín de Sociedad Geográfica de Madrid (Madrid). 1885, 19: 234, 266. ^ Coello, Francisco. Conflicto hispano-alemán. Boletín de Sociedad Geográfica de Madrid (Madrid). 1885, 19: 241, 242, 289. ^ Takizawa, Akira; Alsleben, Allan. Japanese garrisons on the by-passed Pacific Islands 1944–1945. Forgotten Campaign: The Dutch East Indies Campaign 1941–1942. 1999–2000. （原始内容存档于2016-01-06）. ^ Costello, John. The Pacific War, 1941–1945. New York: Quill. 1982. ISBN 978-0-688-01620-3. 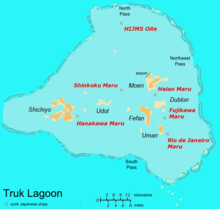 ^ 10.0 10.1 Truk Lagoon and the Lost Japanese Ghost Fleet – The Adventure Couple. Live-adventurously.com. 2012-03-08 [2013-11-21]. （原始内容存档于2016-08-09）. ^ Video: Castle Films Yanks Smash Truk (1944). Castle Films. 1944 [February 21, 2012]. ^ Trumbull, Robert. The 'Graveyard' Lure of Truk Lagoon. New York Times. April 30, 1972. ^ About Cayman Islands – Grand Cayman, Caribbean Vacation – Cayman Islands. scubahalloffame.com. （原始内容存档于2014-11-13）. 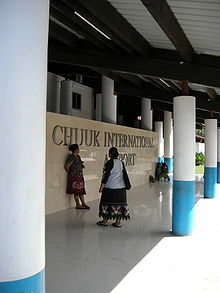 ^ Chuuk Islands – The Blue and the Black – Foreign Correspondent. ABC. 2011-05-20 [2013-11-21]. ^ Paradise island threatened by wrecked WWII oil tanker – environment – 02 September 2008. New Scientist. 2008-09-02 [2013-11-21]. ^ Rainforest Conservation | Volunteer For Animals | Earthwatch News. Earthwatch.org. [2013-11-21].